The United Nations University in the Netherlands (UNU-MERIT) is pleased to announce an agreement with the World Food Programme to provide long-term monitoring, evaluation, analysis and policy guidance in support of WFP’s work with refugee and vulnerable communities in Kenya. Worth USD $2 million over the next four years, this project will be led by Dr. Nyasha Tirivayi of UNU-MERIT. 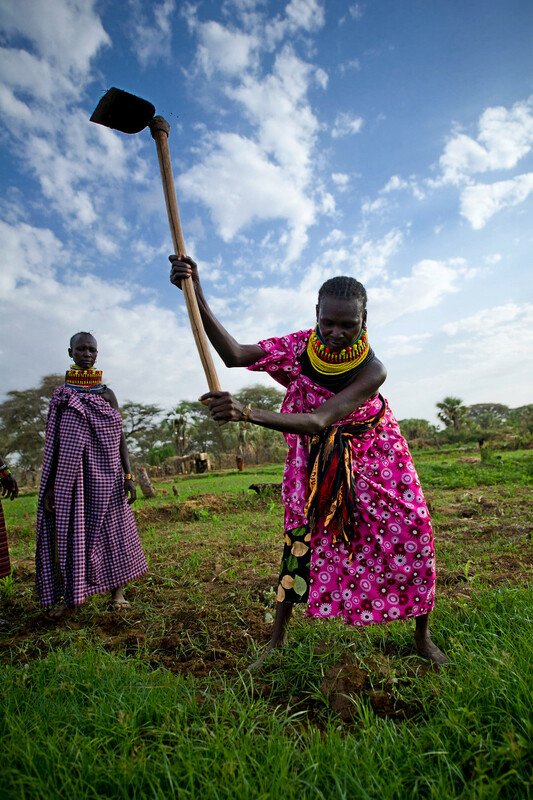 Her team of dedicated researchers will monitor and evaluate the effects of long-term aid programmes to Kenya’s population of some 429,000 refugees and up to 1.3 million people in areas prone to food insecurity and climate disasters. The team’s work will also shape the design and delivery of innovative new programmes. WFP’s current aid programmes include: electronic food vouchers, unconditional cash transfers delivered via bank accounts, food incentives for vocational trainees, capacity building and technical support to local retailers, online work opportunities for refugee youths, school meals, prevention and treatment of malnutrition, and various other relief activities. The project will also assess the user experience, efficiency and contributions to financial inclusion of technological innovations used to deliver social transfers, e.g. mobile phone money systems and electronic bank cards. Along with experts from Kenya’s burgeoning technology sector, WFP and partners aim to enhance food security, livelihoods and self-reliance opportunities of Kenya’s refugees and most vulnerable populations while expanding the digital economy in refugee camps. 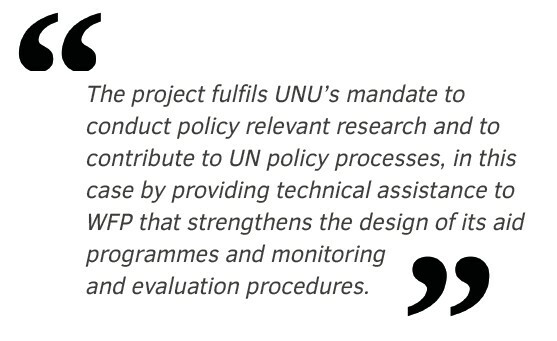 The project fulfils UNU’s mandate to conduct policy relevant research and to contribute to UN policy processes, in this case by providing technical assistance to WFP that strengthens the design of its aid programmes and monitoring and evaluation procedures. The work follows an earlier project for WFP in 2017, which involved conducting an evaluation of cash-based transfer to refugees and asylum seekers in the Kakuma and Kalobeyei refugee settlements. For many in the team, participation in the previous project spawned a new branch of research into humanitarian social protection in protracted refugee situations – work that continues to this day. UNU-MERIT is excited to be able to work in partnership once again with WFP and long-term national research partner, the African Population and Health Research Centre (APHRC), as well as other UN agencies including UNHCR, the Government of Kenya, and private and public sector actors, to conduct innovative research and monitoring of human-centred protection policies, which aim to ensure that those most vulnerable are able to lead healthy, safe and productive lives. Dr. Tirivayi and her team are now working closely with WFP and other partners to create a framework of surveys and cutting-edge behavioural experiments to examine food and nutrition security, livelihoods, aspirations, risk preferences, financial inclusion and gender equality. Over the next four years, these surveys will be rolled out across target populations using statistically representative samples to create an extensive longitudinal dataset. The project will go beyond just examining outcome indicators. It will also produce insights on the design and implementation of aid programmes that are essential for creating holistic policies – policies that put human growth and development at their core to avoid the erosion of human capabilities and freedoms for entire generations. The project’s findings will contribute insights to various UN Sustainable Development Goals (SDGs) – goals relevant to the expansion of social protection coverage to the vulnerable (SDG1), ending hunger among all people including those in vulnerable situations (SDG2), promoting decent work and economic growth (SDG8), reducing inequalities (SDG10), and strengthening implementation and global partnerships for sustainable development (SDG17). Findings will be shared with stakeholders such as the Government of Kenya, UNCHR, FAO, humanitarian NGOs, major donors (including EU ECHO, the Government of Germany, USAID, DFID, etc.) as well as other governments hosting refugees. Work on this project begins in April 2019. Regular updates will be posted via the UNU-MERIT website, social media channels, and various dissemination sessions. For further information, please contact Dr. Nyasha Tirivayi, tirivayi@merit.unu.edu.